Hours of operation: ​The Bog Garden opens daily at 8:00 a.m. The closing time varies with the season. In the cold season (November through February) it closes at 5:00 p.m. In spring (March and April) it closes at 7:00 p.m. During the warm season (May through August) it closes at 8:00 p.m. In fall (September and October) it closes at 7:00 p.m. Directions: Access to these sites is on Hobbs Road off Friendly Avenue to the south or Cornwallis Drive to the north. One route is to start from the corner of Friendly Avenue and Holden Road, go east 0.2 mile to the first traffic light, turn left (north) 0.4 mile to the next intersection with Northline, continue straight another 0.1 mile to the intersection with Starmount Farms Drive. 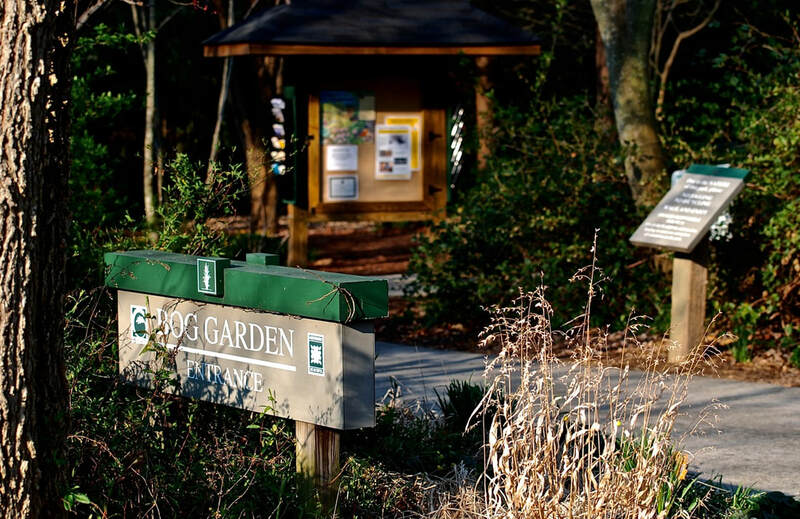 A parking lot is available at the entrance to the Bicentennial Garden on the left, and there is additional street parking on Starmount Farms Drive next to the Bog Garden. There are toilets and a water fountain in the Bicentennial Garden; there are no facilities in the Bog Garden. Click the image to open a site map in a new window. The Bog Garden is a small artificial wetland along a creek that feeds into an artificial lake in a residential section adjacent to a shopping center. That description doesn’t sound nearly as charming as this site actually is. Add to this the formal Bicentennial Garden across the street, and you have a place where a birder can pass a pleasant morning or afternoon. Both sites are administered by the City Beautiful section of the City of Greensboro Parks & Recreation Department in partnership with a non-profit volunteer organization, Greensboro Beautiful, Inc.
​Bicentennial Garden hosts typical Piedmont birds common to yards and gardens that have mature trees and open lawns. It is nice to stroll along paved walks among flowerbeds listening and watching for woodpeckers, nuthatches, and other perching birds. The Bog Garden provides good birding throughout the year, especially for such a small site. More than 150 species have been documented here. Canada Geese and Mallards are there all year. In winter the lake often hosts a nice selection of duck species including Ring-necked Ducks and sometimes Lesser Scaup, Ruddy Ducks, Northern Shovelers, and Hooded Mergansers. Winter Wrens, both Kinglets, and dozens of Yellow-rumped Warblers can be found in the trees and shrubs along the boardwalk in winter, sometimes at eye level. In spring the populations of warblers and other neotropical migrants can be quite good for a few weeks in late April and early May. Downy Woodpeckers, Carolina Chickadees, and Tufted Titmice are common all year. Great Blue Herons are common, and Green Herons are believed to nest here. The willows attract Yellow Warblers and American Redstarts in spring. Brown-headed Nuthatches have nested at eye level next to the boardwalk in some summers. Nesting Barred Owls have produced offspring and may be the most photographed Barred Owls in the U.S. because they tend to perch in full view beside the boardwalk. The entrance to the Bicentennial Garden, a formal 7.5-acre site with garden rooms and sculptures, is across the street and about 100 yards northwest of the Bog Garden. Nearly a mile of paved walking paths provide nice views of the formal plantings, which are particularly beautiful in spring and summer. The mature trees and understory of shrubs provide good habitat for Northern Cardinals, Gray Catbirds and Brown Thrashers, and typical open area birds such as American Robins and Northern Mockingbirds are common. Typical birds of our area such a White-breasted Nuthatches nest here.